The Samsung F250 is a bit of an oddity - it looks expensive, but it isn't really. And it also comes with an unusual combination of features that means that it doesn't quite fit into a traditional product range. The most obvious thing about the SGH-F250 is the glossy looks. Slide it open, and there's a stylish metal keypad, and the presence of dedicated media keys on the front indicate that this is a multimedia device. In fact, the Samsung F250 can play back a variety of multimedia files, has an FM radio, microSD expandable memory and Bluetooth 2.0. Where it gets a little strange are the rest of the specifications - the 2 inch display is only 128x160 pixels, and the digital camera comes in at a so-so 1.3 megapixels. So in fact, what we have here is a phone with pretty good multimedia capabilities but one that cuts other features back to keep the price down. At around €190 or so SIM-free, the F250 costs roughly the same as the Nokia 6300 - but the Nokia 6300 has a much better display and camera. 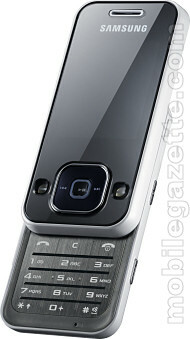 Most customers will probably buy the SGH-F250 based on looks alone, and it's certainly an attractive looking device. The F250 should be available at the beginning of Q1 2008, although the only country where it has been confirmed for release so far is Russia.